Microsoft Azure : Create Point to Site VPN Connection Step By Step Tutorial With Training Video. ~ Microsoft Azure Step By Step Tutorials And Free Online Training Videos. Microsoft Azure cloud allows us to create a point to site VPN gateway connection which lets you create a secure connection to your azure virtual network VNet from an on-premises individual local client computer and all this will be done using azure new portal resource manager deployment model Azure ARM. This configuration uses self signed root and client certificates for authentication. In this case only a pc can connect to azure vlan whose certifcates have been generated for authentication. We will download and install windows software development kit sdk for windows 8.1 on our on-premises client pc. In this tutorial we will create a test virtual network in azure ARM, install a VM and assign that virtual network vnet to it and connect to that vnet from on-premises local pc using a point to set vpn secure connection. The public key (.cer file) generated from the root certificate is uploaded to Azure which acts as trusted certifcate for authentication purpose. We can further create a client certificate generated from root certificate and use it on local client machines for connecting to azure virtual network vnet. VPN client configuration files can be downloaded from Azure required by client pc's for connecting to azure vnet. This type of connection is mainly used in premises as a solution where you require only few machines to connect to remote virtual machines on the azure public cloud network. Point to Site VPN connection supports up to 128 VPN clients to be able to connect to a virtual network at the same time. The connection needs to be dialed everytime you reboot your pc since it doesn't auto reestablish connectivity. Lets take a look at free practical step by step procedure for the same. Free Step by Step Procedure to Create Point to Site VPN connection in Microsoft Azure Public Cloud using Azure Resource Manager ARM web based user interface GUI. Step 02 : Click on Virtual Networks in the left panel. We will first create a test virtual network to be used in our demonstration. Step 03 : Click on Add tab at athe top to create a new test virtual network vnet in azure resource manager arm. Step 04 : Fill up new Virtual Network name, address space, select subscription free trail or paid, resource group, location, subnet, address range and click on create. Step 05 : New Virtual Network Deployment in progress. Step 06 : New Azure Virtual Network VNet deployment completed successfully. Step 07 : Select New Virtual Network and click on subnets in left panel and then on gateway subnet at the top to add new gateway subnet. Step 08 : Set the address range (CIDR block) for new gateway subnet and click on ok. Step 09 : Gateway Subnet added successfully in Azure ARM. Step 10 : Now we will create a new test virtual machine to use the created vnet. Click on Virtual Machines in left panel and click on add tab at the top. Step 11 : Select Windows Server from azure arm image gallery and click on required Windows OS and version to create new VM. Step 12 : Select resource manager deployment model and click on create as shown in screenshot. Step 13 : Fill up VM name, VM disk type SSD or HDD, VM admin login credentials, subscription free trial or paid, resource group, location and click on OK. Step 14 : Select VM hardware configuration size and click on select. Step 15 : Select HA availability sets, storage, newly created Vnet, subnet, public ip, nsg firewall endpoints, then other details and click on OK. Step 16 : Wait for VM validation test to pass and then click on purchase. Step 17 : New VM deployment completed sucessfully. Step 18 : Now click on New at the top in left panel and search for Virtual network gateway and select it. Step 19 : Click on create in Virtual network gateway window to proceed. Step 20 : Fill up virtual network gateway name, select vpn gateway type, route based vpn type, sku basic option, vnet, public ip, subscription, resource group, location and click on create. Step 21 : Virtual Network Gateway deployment in progress and may take around 46 minutes to provisioned in azure arm. Step 22 : Next step download windows sdk for windows 8.1 and install the same. Step 23 : Install windows software development kit sdk. Click on continue. Step 24 : Select only Windows Software Development Kit in the wizard and click on download. Step 25 : Windows Software Development Kit installation in progress. Step 26 : Windows Software Development Kit installation and download completed. Click on close. Step 27 : Run command prompt as administrator and change directory to mentioned path. Step 28 : Run below two commands in command prompt window for creating root and client certificates as shown in screenshot. makecert -sky exchange -r -n "CN=CloudTuitionsRootCert" -pe -a sha1 -len 2048 -ss My "CloudTuitionsRootCert.cer"
Step 29 : Both commands executed successfully in command prompt window and type certmgr.msc to open certificate manager. Step 30 : Now right click root certificate and click on export. Step 31 : Follow the root certificate export procedure as shown in screenshot. Click next on certificate export wizard. Choose No, do not export the private key option and click on next. Select Base-64 encoded X.509 (.CER) option and click on next. Type a filename and specify location for .cer file to save to local computer. Click on finish to complete the certificate export wizard. Step 32 : Follow the client certificate export procedure as shown in screenshot. Right Click on Client certificate and click on all tasks and then click on export. Choose Yes, export the private key option and click on next. Select Personal Information Exchange - PKCS #12 (.PFX) option and click on next. Type a desired password and click on next. Type a filename and specify location for .pfx file to save to local computer. The export was successful message pops up. Click on OK. Step 33 : Root & Client certificates exported to C drive. Now follow the next steps. Right click on exported root certificate and open with wordpad. We will require this certificate data to be copied and uploaded to azure for denoting it as a trusted certificate. Keep the wordpad open aside. 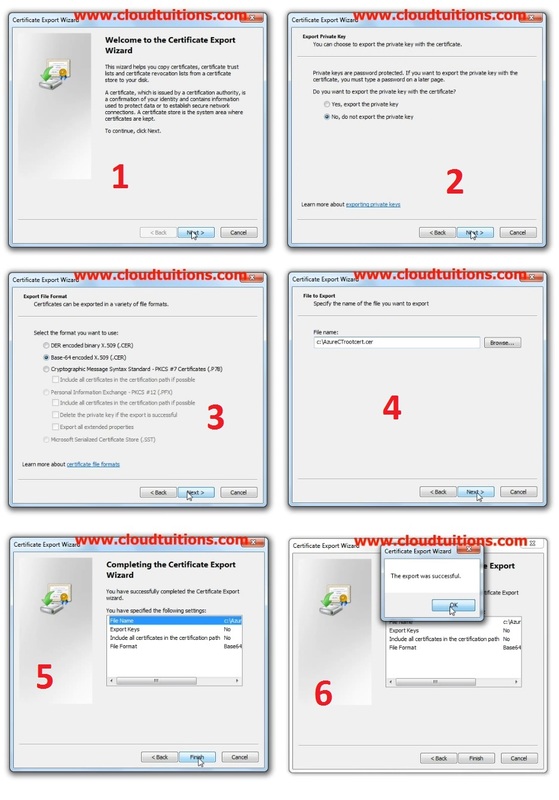 Now double click the client .pfx file and click next on certificate import wizard. Now specify the file location path and click on next. Type the password for the private key and choose include all extended properties option and click on next. Choose Automatically select the certificate store based on the type of certificate and click on next. Click on finish to complete the certificate import wizard. The import was successful message pops up. Click on OK. Step 34 : Now go to virtual network gateways and select our created virtual network gateway to create point to site configuration. Click on Point - to - Site configuration and mention the IP address. Copy the certificate data in the open wordpad and paste it in Public Certificate Data as shown in screenshot. Please note exclude start line --- Begin Certificate --- and ---- End Certificate ---- from copying while pasting. After pasting, click on save tab at the top to save the point to site configuration and allow changes to take effect. Point to site configuartion deployment saved successfully. Now click on download VPN client next to save and discard button at the top. Step 35 : Now download the VPN client and extract the zip file contents to your PC. Double click the vpn client file and click on run. Click on Yes to install. Client will get install and connection will get created in your network connections. Select the connection and click on connect. Dialer windows will open up. Click on connect tab. Click on continue tab as shown in screenshot. Click on OK in next screen. Check the connection status in network connections. Now go to that VM and check the Private IP in overview tab. Take a rdp session using that private ip of the VM. We are successfully logged in to VM using the private IP. Thus we have successfully created Point to Site VPN connection in Azure Cloud Infrastructure ARM and tested the connectivity. 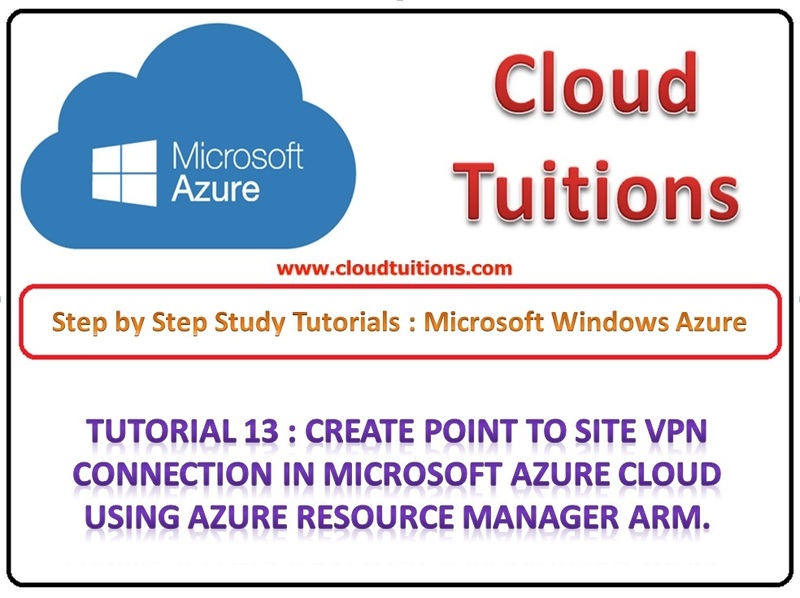 Watch Step by Step Microsoft Azure Free Youtube Video Tutorial on How to create Point to Site VPN connection in Microsoft Azure Cloud using Azure Resource Manager ARM.